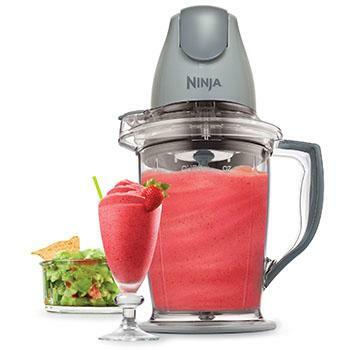 Put the power in the palm of your hand with the multi-talented Ninja Master Prep that crushes ice into snow in seconds, blends frozen fruits into creamy smoothies, and chops fresh ingredients evenly! Mince, dice, chop, blend, and puree for consistent results in the 16 oz (2 cup) chopper bowl and achieve perfect frozen blending in the 48 oz (6 cup) pitcher. The interchangeable and ergonomic 400-watt power pod quickly switches between the 16-oz chopper bowl or 48-ounce pitcher for added versatility in the kitchen. The pod features a large one-touch pulsing button for ultimate control and consistent results. Wide, no-slip bases and splashguards on the pitcher and chopper keep everything steady and clean. For added convenience, storage lids are included to keep your food fresh and all removable parts are dishwasher-safe. Create, store, microwave and serve! SKU: B003XU3C7M. Categories: Blenders, Countertop Blenders, Food Processors, Home and Kitchen, Home and Kitchen Features, Just arrived, Just Arrived, Kitchen, Kitchen, Kitchen, Kitchen and Dining, Kitchen and Dining Features, Small Appliances, Special Features. 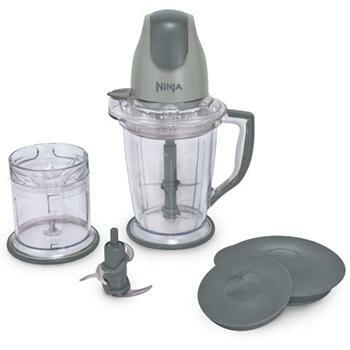 Be the first to review “Ninja Master Prep (QB900B)” Click here to cancel reply. YummyHappyTummy © 2019. All Rights Reserved.